A member of the Passionflower family, the Passiflora genus has about 500 species, three of which are successful in the desert southwest. 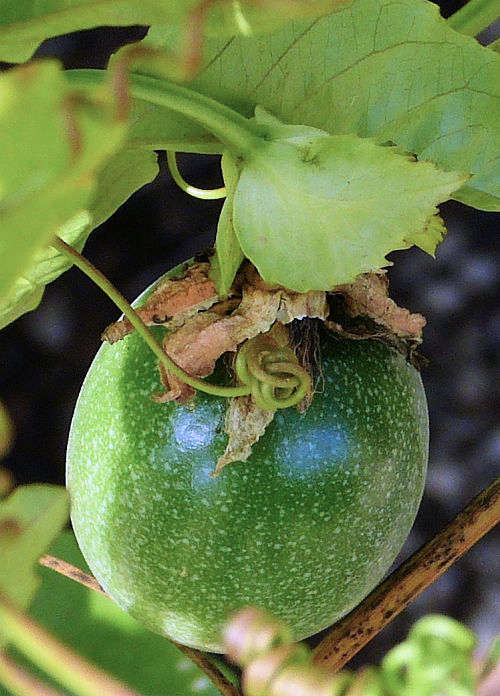 Passiflora edulis, Passionfruit Vine, is commercially grown for its fruit. 'Incense' is a hybrid of P. edulis and P. cincinnata, and is grown for the beauty and fragrance of its flowers as well as its good-tasting fruit. 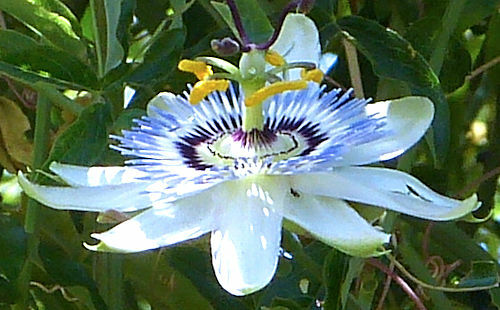 Passiflora caerulea, Blue Crown, is one of the most easily grown ornamentals. Other hybrid ornamentals are also popular. 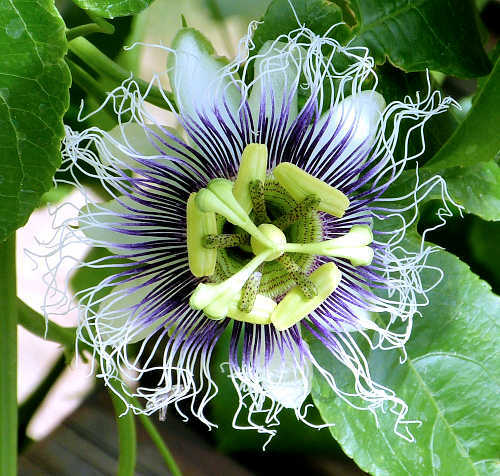 Lifespan: 3-7 years for Passiflora edulis under commercial cultivation. Leaf retention: Evergreen but frost-deciduous. Flowers: An elaborate structure, 3-4" wide, consisting of three stigmatas above (female), five stamens below (pollen-bearing male), many dozen filaments, 10 petals and five green sepals underneath. Each flower lasts only one or two days. Passiflora edulis has yellow-green stigmatas and stamens, purple and white filaments and white petals. 'Incense' is fragrant, has white stigmata and stamens, purple filaments and purple petals. Blue Crown is fragrant, has purple stigmatas, yellow-green stamens, white and blue filaments, and white petals. Bloom: Passiflora edulis: mid-spring into fall and year-round in some locations; 'Incense': mid-spring through summer; Blue Crown: mid-spring to early summer. Blooming starts further into summer for northern locations. Self-fruitful: Yes except for 'Incense' which needs cross pollination from a second plant. It may be necessary to hand pollinate any of these species if bees do not find the flowers. The best time to hand pollinate is about 10am in the morning. Clip off one of the five stamens and rub the yellow side on the end of each of the three stigmatas. Years before fruiting: 1-1/2 to 2. Fruit: Round or ovoid, 1-1/2" to 3" wide, a smooth, waxy, leathery rind. Passiflora edulis fruit are purple when ripe. The rind contains aromatic, membranous sacs filled with orange-colored, uniquely flavorful pulpy juice and many small hard, dark, edible seeds. 'Incense' has flavorful, yellow fruit, edible gelatinous pulp and dark seeds. Blue Crown has orange fruit with soft, sweet red pulp and seeds that can be mixed with other fruit or juice for an exotic flavor. Months for fruit to ripen: 2-3. Passiflora edulis is ripe when ready to fall from the vine. 'Incense' is ripe when slightly dented or wrinkled. Blue Crown is ripe when fully orange. 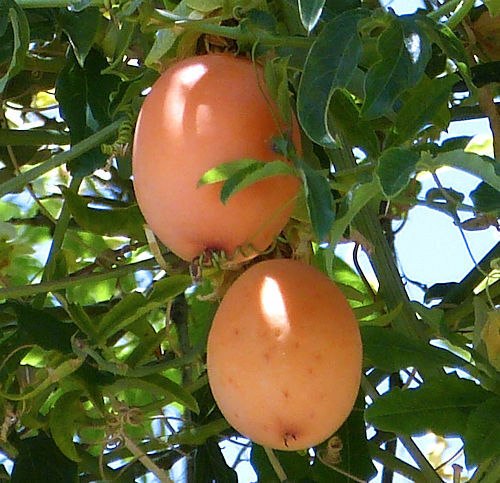 Storage after harvest: Passionfruit continue to ripen after harvest and can be refrigerated in sealed plastic bags up to 2 weeks. 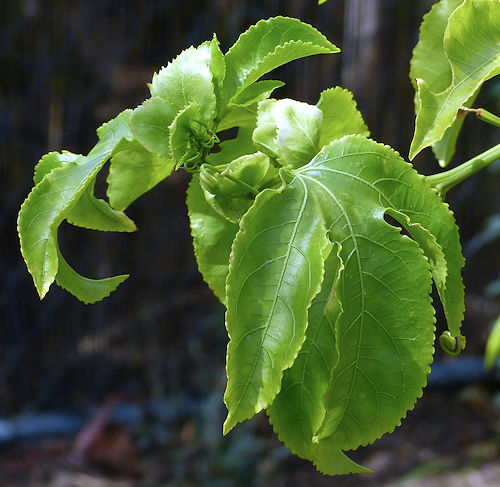 Leaves: Green, palmate with three lobes on Passiflora edulis, three or five lobes on 'Incense' and five fingers on Blue Crown. Stems: The vine climbs using tendrils. Stems are herbaceous at first, then become woody with age, except in regions with winter freezes where they die to the ground and come back from their roots. Roots: Shallow, spread by root suckers, aggressive in moist soils in warm locations. Passiflora edulis is sometimes grafted onto Passiflora edulis flavicarpa (Yellow Passionfruit) rootstock, which better withstands soil diseases. P. caerulea: Blue Crown - a fruiting ornamental. Wildlife: Attracts bees, butterflies and hummingbirds. 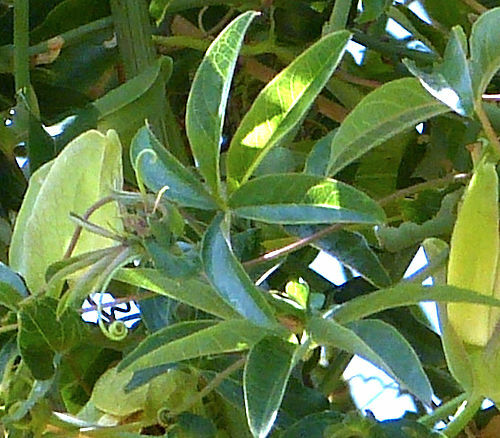 Passionflower and Passionfruit vines are caterpillar hosts for the Gulf Fritillary and Variegated Fritillary butterflies. Birds and mammals eat the fruit. Toxic / Danger: All parts are poisonous except ripe fruit. USDA hardiness zones: Passiflora edulis 8-10, 'Incense' 6b-10, Blue Crown 6-10. The vines die to the ground in freezing temperatures and come back from their roots in the spring. Sun: Full sun to part afternoon shade. More sun produces more flowers and fruits. Drought tolerant: No. These plants prefer high humidity. Water after becoming established: Twice a week in when fruiting. Additional water may be needed for most cultivars when temperatures are over 90°F. Insufficient water causes fruit wrinkling and drop. In winter, water less often. Soil: Well draining, moist, moderate organic content, pH 6.6-7.5 (neutral). Fertilize: Use compost as a slow-release source of nitrogen. Mulch: A 4" layer of aged compost, leaves, shredded bark or wood chips helps moisture retention and reduces heat and cold stress for the shallow roots. Planting: The plant can also be grown in large containers. First Year Care: Water deeply, but gradually taper off from every two days to weekly to encourage roots to grow deep and wide. Prune: To shape anytime when the vine grows out of bounds. Remove dead and damaged vines after the danger of freezing temperatures has passed. Flowering occurs on new vine shoots. Litter: Flower and fruit drop if not harvested. Dead vines and leaves in regions with freezes. Propagation: Cuttings are the preferred method. Seed, which does not always breed true, must be planted fresh and not dried or refrigerated. Pests: Butterfly caterpillars may temporarily defoliate the leaves, but the plant will recover. The many cultivars and hybrids of these plants can make identification problematic. 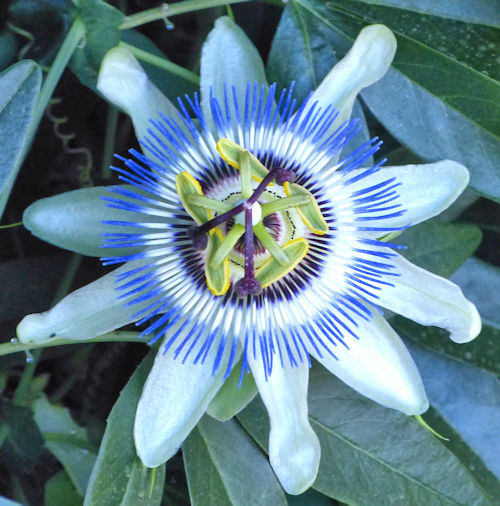 Rating Passionflower fruits by taste from high to low: Passiflora edulis is best, followed by 'incense', then the eastern North American species Passiflora incarnata (Maypop), and finally, Blue Crown. Do you have additional information or a different experience for this plant that you would like to share? Email info@gardenoracle.com. All contributions are welcome and appreciated.